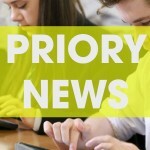 This year students from Priory Integrated College will be taking part in BBC News School Report. We aim to publish the news by 1600 GMT on 16 March 2017, so please save this page as a favourite and return to it later. 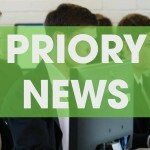 We are a group of students producing the news report for the BBC News School Report. We are currently studying BTEC Information & Creative Technology Level 2 and this opportunity to work with the BBC allows us to showcase our creative skills. 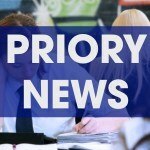 We think we are very lucky to be studying in Priory because every pupil and every teacher has their own iPad which we use for learning in the classroom and at home. 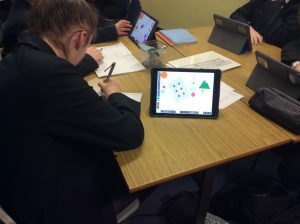 We make use of a variety of apps that help us learn. 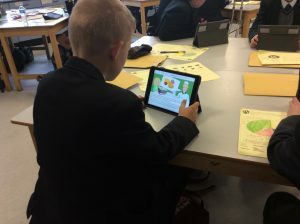 We found year 8 pupils busy on their iPads in Home Economics and GCSE pupils with Miss O’Reilly preparing some very important notes for revision. Further down the corridor, we found Maths students with Mr Kelly looking very interested in learning about angles and tessellations!